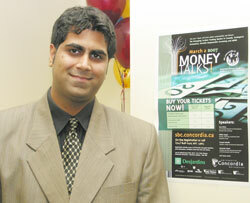 Rizwan Moorji is using his co-op experience to run Concordia's third annual sustainable business conference. How many undergraduate students can say that they chaired a business conference? How many others can say that they have a year’s full-time work experience with a prominent institution when they graduate? Meet Rizwan Moorji. Moorji is pursuing an honours degree in economics and a minor in business studies. He is also a member of the Institute for Co-operative Education (co-op). The co-op program allows students to gain practical work experience by working in professional work environments. “In terms of professional experience, you get to see what a real work environment is like and gain experience in the competitive world of job hunting,” Moorji said. “It builds your self-esteem. You learn how to handle pressure situations and conduct yourself in an interview." The three-year program offers no breaks to students, who are either studying full time, or working for one of the many companies that recruit at Concordia's co-op program. “There is no summer vacation, because you are either working or in school,” Moorji said. Why would anybody put himself through it? For one thing, the work experience offers great networking opportunities to secure jobs once students graduate. Also, the projects are often challenging and enriching for the student and the community in general. Moorji's job this semester is to organize the Sustainable Business Conference (SBC). His employer is Concordia University. The conference, now in its third year, is part of the Sustainable Concordia Festival, to be held from Feb. 27 to March 2. This year's theme is Money Talks! It is designed to challenge the conventional models of business management by exploring successful, sustainable and innovative alternatives. The daylong conference March 2 in the D.B. Clarke Theatre will include presentations and roundtable discussions with speakers from the north-eastern United States, Quebec and Ontario. A wine and cheese will be held during lunchtime on the seventh floor of the Hall Building. The Desjardins Group is a partner in the event, and internal sponsors, from the President's office to the Marketing Communications Department, are helping put it together. “We also have an advisory committee who help us make decisions, Concordia professionals and students who believe in us and this conference," Moorji said. Approximately 350 participants are expected, most of them from Concordia and other educational institutions in the area. The conference prides itself on being carbon-neutral by using 100 per cent post-consumer waste paper, supporting local companies, using bulk products for refreshments, choosing an environmentally friendly menu and fair trade coffee. “We try our best to be as sustainable as we can,” Moorji said.